The original Durango won a lot of hearts with 7-passenger seating and optional V8 power. The 2nd generation Durango retains these characteristics, adding some unique styling and available HEMI power. Pricing for the new Durango varies from $30k for a V6 base model to almost $40k for a loaded HEMI powered model. In 2009, a hybrid system joins the lineup pairing the 5.7L V8 with a version of the two-mode hybrid system found in some GM vehicles. A two-mode hybrid version joins the lineup for 2009. The Hemi Hybrid pairs the 5.7L V8 with the two-mode hybrid system found in GM vehicles. The hybrid has an estimated fuel economy of 19 city/20 highway. Non hybrid models benefit from updates to the 5.7L V8. 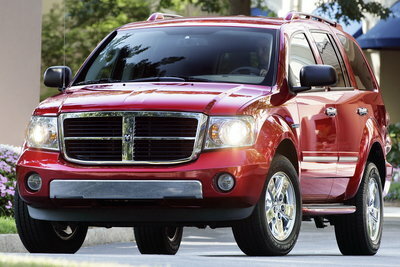 The updated Hemi increases power and fuel economy.